WHALES: Tales, Facts & Updates – Neptune 911! Our four-vehicle caravan bounced along the 2-hour Baja dirt road to San Ignacio Lagoon where Captain Melville Scammon first led six whaling vessels in 1860. 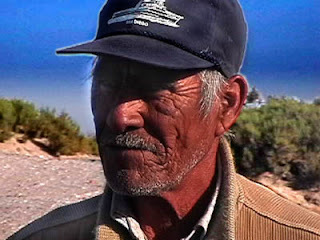 Scammon and other whaling captains risked the narrow and shallow water passage into the lagoon, where for centuries, gray whales safely bore their young. The ensuing whale slaughter initiated the near extinction of the Pacific Gray Whale. 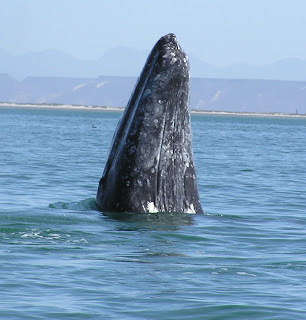 Today, the lagoon is a World Heritage site, and gray whales have reclaimed their sanctuary. Now with limited permits, one can visit the lagoon and experience—up close and personal—the majesty of these creatures. Your vessel is an 18-foot wooden fishing boat, a panga. It’s similar to a dory. It was in one of these pangas where in 1972, Pachico Mayoral, a local fisherman, was approached by a gray whale. Surprised by the whale’s lack of aggression and its insistence, Pachico reached his hand out to the whale. 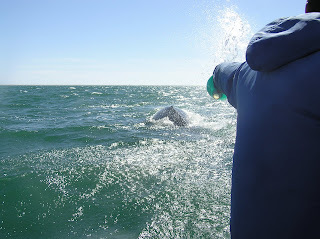 The whale moved in closer and allowed the fisherman to touch it. Of course this was a heck of a whale story back at the lagoon’s village. However, word made its way out of the secluded village and curious visitors began arriving to experience this new relationship between human and whales. Pachico’s Eco Tours led our adventure. Eight of us filled one panga and six filled the other. Our respective captains opened their outboards. We navigated the salty swells to the whale nursery. Dolphins skipped along the nursery’s perimeter. Our captain whistled and they came closer. He spoke fluent dolphin. The San Ignacio Lagoon whales were all around us. 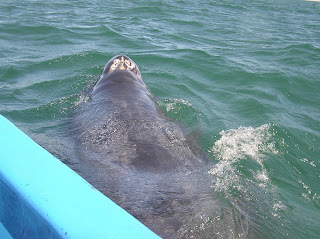 We watched them breech, spyhop, and swim close by, but none chose a visit to our panga. When lunchtime arrived, our captain made waves thru the placid and clear lagoon to a sandy shoreline. Here Jesus Mayoral, Pachico’s son, answered the billion questions we asked while munching on homemade burritos and cold soda. “Let’s see what we can find out there now,” Jesus said, as he and the other panga captains took us back to the nursery. Our captain took a different route. Now the water was choppy and windblown. Dolphins signaled our closeness to the whales. The captain silenced his outboard and began scooping and tossing water into the distance. A 40-foot cow surfaced. She was so close that when she spouted, her wet exhale showered my face and shoulders. She eyed the panga, grunted, and her 15-foot, 1.5-ton calf followed suit. Here baby, here, baby beseeched like a prayer. My tears at the nearness of these two made photographing their closeness impossible. The pair circled our boat, swam under the boat and touched the bottom of our boat. Finally, curiosity brought the calf alongside. Hands reached out to let him know that mutual inquisitiveness was aboard along with our desire to connect. I gave up my photo quest. No longer did I know if I was star board or port side. To touch that one-ton creature erased my boat safety knowledge. But, alas, he came to where my hand reached for him. He raised his steel grey back and my right hand was able to run the course of his spine. What did it feel like? Rubbery. Soft. Cool. Magnificent. Like the evening prior when I uncontrollably shook and was unable to identify the spot that was touched, so it happened again with this dream-like whale encounter. My writer friend, David Wagstaff, has told me time after time, “Char, you are such the earth mother.” I guess I am. Whether my hands are in the dirt, or skimming the salty seas, I’m in a peaceful place that not even a church can match. Touching and sensing the little guy I called “Skippy” (little being relative to his multi-ton mother) will be a challenging emotion to match and jumped far ahead of anything I experienced before. 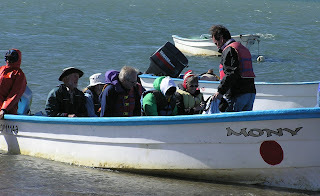 Photo credits: Pachico Mayoral, Pachico’s Eco Tours; Panga Load, Charmaine Coimbra; Spouting Whale, Fred Heinecke; Spyhop, Charmaine Coimbra; Splashing for Whales, Charmaine Coimbra; Skippy 1, Charmaine Coimbra; Skippy 2, Fred Heinecke.